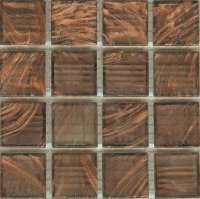 This is a bronze vitreous glass tile with added gold coloured streaks / flecks. The pattern of streaks in each tile is unique so there is always something to catch the eye and to bring the tiles 'to life' when the light catches them! Sorry but this colour has been so popular in the last few weeks that we have run out! We will have plenty more in stock soon so please contact us if you would like a sample or if you would like us to email or telephone you when this colour is back in stock. Did you know that the Villa Romana del Casale in Sicily has the largest collection of late Roman mosaics in the world and that it is protected as a UNESCO World Heritage Site.